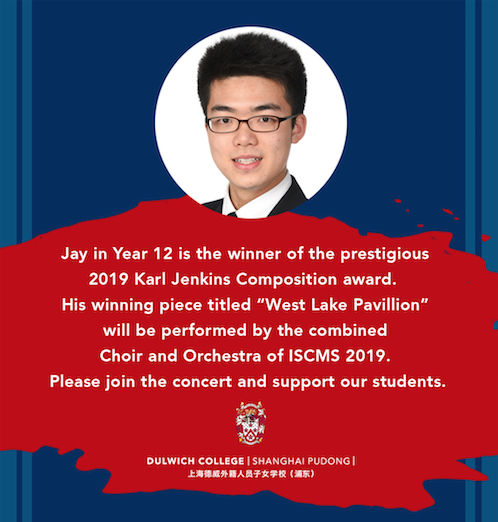 It is with great pleasure that we can announce Jay, Year 12 from Dulwich College Shanghai Pudong, won the prestigious 2019 Karl Jenkins Composition Award with his piece titled West Lake Pavilion. The Jenkins Award is open to participating schools in the International Schools Choral Music Society. It challenges students to bring together many cultures with diverse backgrounds to foster a global music experience. 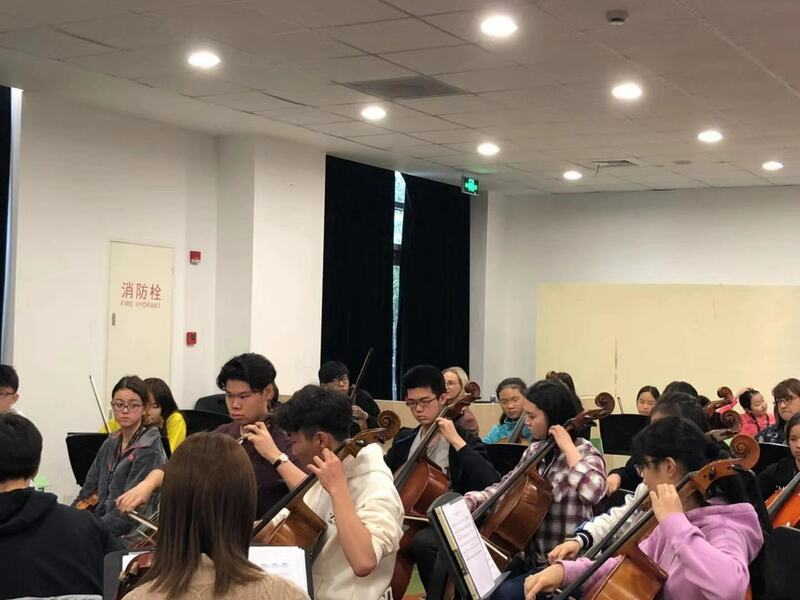 Jay's piece was performed by the combined ISCMS choir and orchestra at the gala concert in the Shanghai Symphony Concert Hall on February 23 along with performances from 26 International Schools, with close to 100 students from 7 Dulwich College International schools participating. "The West Lake in Hangzhou is renowned as one of the most beautiful natural lakes in China, with countless poems reciting its beauty across the ages. The lyrics in this piece are inspired by a poem by Liu Yong, a poet from the Song dynasty, as he was traveling around the country. Dong Nan Xing Sheng literally means the South-East (where Hangzhou is located) is a prime location and Liu Yong elaborates on this by commenting on the splendor and beauty of both the city and the natural scenery. The use of melisma reflects the natural stress and emphasis of Song Dynasty poetry, such as the poem by Liu Yong on which this piece is composed. Throughout the piece, melodies are echoed across all four vocal registers, resembling almost a canonical competition between four voices." The judging panel highly praised Jay's entry, writing: "It shows a good sense of musical structure. Its material is apt for its expressive purposes, and its melodic and harmonic ideas are distinctive. " We congratulate Jay for his amazing achievement.